Heat a small amount of oil in a large skillet. Saute the ham and asparagus until the ham is lightly browned and the asparagus is tender. Remove from heat and allow to cool. Meanwhile, whisk together the dressing ingredients in a small bowl until well combined. Set aside. In a large bowl, toss together the peas, onion, cucumber and arugula. Add the pasta, ham, and asparagus. Stir to evenly distribute. Gently stir in the dressing until the ingredients are evenly coated. Refrigerate up to one day or serve immediately. Matt's been off on spring break so I haven't had to make my usual cold dinner for him to take on the night he goes directly from work to class. He goes back tomorrow so I thought why not kill two birds with one stone and use up the ham we bought on sale (my mom hosts holidays so we never have leftovers) and some vegetables we had on hand and make a packable dinner? I love getting my farm box delivery (although I don't get it every week until the growing season really picks up), the arugula from last Tuesday was still super fresh! I tossed that in along with some asparagus, peas, cucumbers (which aren't quite in season here yet) and red onion for crunch and bite. 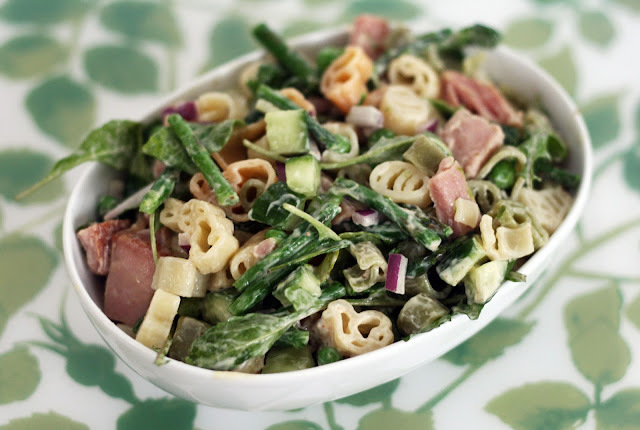 I wasn't sure about ham in pasta salad but it was actually really good; just resist any temptation to add salt. I'm adding this to the rotation for next spring, it is a great way to use up spring and Easter odds and ends. We also made a great spring vegetable matzo ball soup for Passover this year if you are interested!